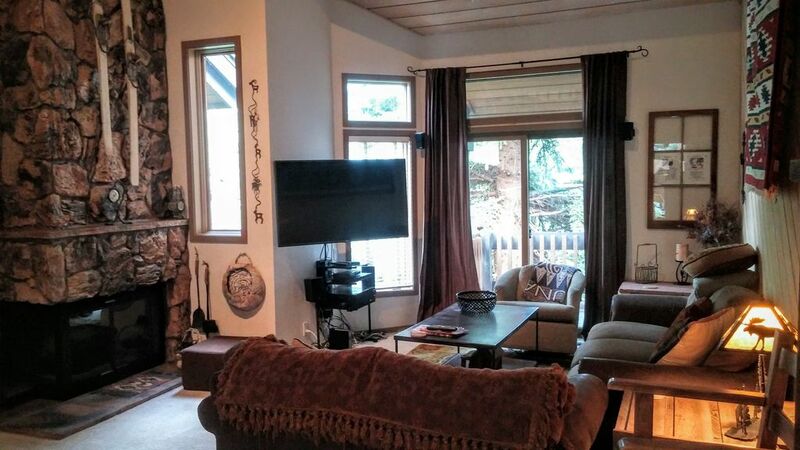 Private Setting in This Ski in / Ski Out Mountainside Home! JANUARY Special of $400 a night (3 night min) plus fees. If Calendar for this home shows booked, please still inquire as I have 4 in this same association. Great for the large groups! Snow in Beaver Creek is great, so book now for your Winter Trip. Ski In from Bachelor Gulch - left of the Ritz Carlton - in five minutes. Ski Out is 160 steps up around corner before you can 'gear up' and let gravity take you down to 'Lower Beaver Creek Mountain Express.' Else the Shuttle (Valley Route) runs every 12 minutes from front door to BC Village from 7 am to 5 pm. Dial-a-ride service (970.949.1938) available throughout Resort at an on call basis. This freshly painted Townhome has updated bathrooms and a large Kitchen with granite countertops that feature bartop seating. The Dining Room has 6 seats and extends into the Living Room. Features include Wood Burning Fireplace with nice entertainment: Stereo, CD / DVD player, Wireless Internet and a 40' Samsung Flatscreen TV. Walk out to the expanded back deck and BBQ Grill. Master Bedroom: Features a King size Bed with Lodgepole Pine Headboard / Footboard, rustic 8 Drawer Dresser / Mirror with Flatscreen TV. Attached Full Bath with Slab Granite Tops and custom Medicine Cabinet! 2nd Bedroom: Features a raised Queen size Bed with matching Headboard / Armoire, rustic Desk and Flatscreen TV. Attached Full Bath. 3rd Bedroom: Features a Queen size Bed with matching Headboard / 7 Drawer Dresser and Flatscreen TV. Bathroom is 'common' 3/4 Bath in Hallway. *All Beds have mattress covers with extra Linens under them! AMENITIES include: 2 Tennis Courts, Hiking / Biking Trails, Swimming Pool and Hot Tub. His and Her changing rooms with Dry Sauna. FREE Computer / Internet Access at Office with LAN and Wireless from the Home itself! As a local Realtor and investor, I know the rental numbers. A decade of experience in both long and short term rentals helps tune in the success. The most mature tree setting in almost all areas of Beaver Creek. 2 Tennis Courts with trails for summer hikes / bike trips. Winter has easy Ski In and 160 steps to where gravity can take you down the hill to Ski Out. Large Living space to everyone to hang out after the day. Great mature landscaping surrounds this townhome on 3 levels. All 3 bedrooms are on lower level which makes for cool sleeping during the summer. Large hang out space on main living level, which includes kitchen, dining, and living room. Loft above makes for additional sleeping area! 2 Tennis Courts with His / Her changing rooms, hot tub, dry sauna, and Swimming Pool (Open Only during Summer). Side by Side w/ water and ice dispenser. Granite Tile kitchen countertops with 3 bar stools. In living room and all 3 Bedrooms. All 4 TVs on property hooked up to cable. Deck off living room surrounded by 2 large evergreens and through to Tennis Court. Patio is off the 3rd Bedroom and very private. Located by Hot Tub / Pool. Open Year Round. FREE Shuttle throughout Beaver Creek. We spent 6 weeks here and were generally pleased with the property. The location is great, the Beaver Creek dial a ride is easy and access to the village and parking there are also a breeze. Layout of the townhome is nice having the living area separate from the bedrooms. Only issue there is that all the bathrooms are on the lower level which could be an issue if you have a full house with people sleeping in the loft and needing to go down two flights of stairs at night. I know that having two huge spruce trees blocking the natural light and 'shedding' on the balcony is out of Mike's control but getting those trimmed would be a huge boost. Kitchen is well stocked, having a gas grill is wonderful! If the pool and renovations are done by next summer, we'd happily rent 163 again! Mike was easy to work with and responsive. Thanks Carol. If I could cut or trim the trees I would as I agree about the light. Glad you enjoyed your time here and hope to have you back next summer! This townhouse was perfect for our family ski trip. The place was well furnished, clean and very convenient. When I booked the townhouse, there were 7 of us - we had an additional 3 people join and everyone was comfortable. The shuttle service was so efficient and timely that we never took advantage of the ski in/ski out ability. Michael is super helpful with anything that you need - restaurant recommendations, general questions and very responsive regarding townhouse questions. Would rent this unit again. We enjoyed the convenience of the shuttle service that takes you to the slopes or to restaurants within a certain area. Michael was also great and he made sure we had everything we needed to make our stay as enjoyable as possible. Mike was great to deal with and the condo was exactly as advertised. Very clean. Not specific to this condo but Beaver Creek seems more expensive than is warranted for the skiing experience. We caught a dry week though. Great Location. Easy access to ski trails. Great Location, well equipped! Easy access to ski trails and on the bus route so it is easy to move around to and from the base of the mountain. The owner was very kind and reachable. it was a confortable townhouse for two families with teenagers. Una casa súper bien ubicada, con fácil acceso a las pistas y en la via del bus que te puede transportar fácilmente a la base de la montaña. El dueño muy amable y atento. Fue una casa muy cómoda para dos familias con adolecentes. Muy recomendable. Great stay. The furnishings were excellent and Mike did a great job in making sure everything was perfect. Thanks for a great stay and we look forward to coming again.